USA | Vad kommer att bli kvar av president Barack Obamas reformer efter (minst) fyra år av Donald Trump? Obama själv verkar inte alltför oroad. 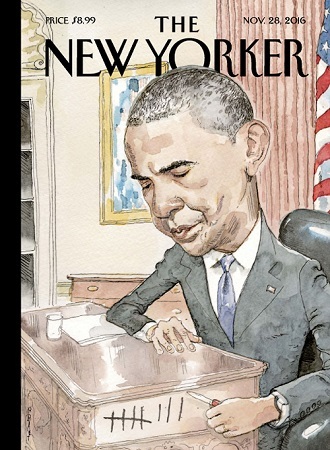 I The New Yorker berättar han för David Remnick att han tror att Trump bara kan riva upp cirka femton till tjugo procent av hans administrations reformer. Tidskriftsomslag: The New Yorker, 28 november 2016. Politik: USA:s ekonomi efter Barack Obama! EKONOMI | President Barack Obama har varit bättre för USA:s ekonomin än vad företagen vill erkänna. 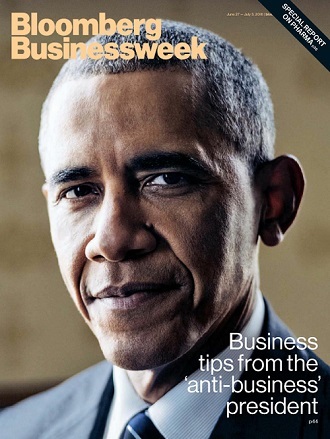 När Obama intervjuades av ett team från tidskriften Bloomberg Businessweek lyckades han även få in en giftig kommentar om att Donald Trump inte uppfattas som speciellt framgångsrik bland många affärsmän. The stock market has tripled. Profits are very high. And yet you still have this label of being an anti-business figure. How do you look at that? Well, first of all, toward the end of my second term, I think among the business community, there’s maybe a greater acknowledgment, a less grudging acknowledgment, that we steered through the worst financial and economic crisis in our lifetimes successfully—certainly more successfully than many of our peers. We’re now 10 percent above the GDP pre-crisis. In Europe, for example, they’re just now getting back to even. As you mentioned, the stock market, obviously, has come roaring back. But I think more relevant for ordinary folks, we’ve cut the unemployment rate in half. We’ve been able to have the longest [stretch of] consecutive months of private-sector job growth in our history. Biggest job growth since the ’90s in manufacturing. The auto industry has come roaring back and is selling more cars than ever. We’ve doubled the production of clean energy. Our production of traditional fossil fuels has exceeded all expectations. We’ve been able to grow the economy, reduce unemployment, and cut the deficit by around three-quarters, measured as a percent of GDP. So it’s hard to argue with the facts. I think where the business community has traditionally voiced complaints about my administration is in the regulatory sector. And yet, if you look at the results—Dodd-Frank being a good example—it is indisputable that our banking system and our financial sector are safer and more stable than when I came into office. Now, what’s also true is that banking profits are not as outsized as they were, but I don’t consider that a bad thing, and I think most Americans don’t either. They’re still making a profit, it’s just that there is a froth that’s been eliminated, and that’s good over the long term for the financial sector. We’re going to have a global entrepreneurship summit—the last one of a series that we began when I first came into office. And the enthusiasm from around the world about these summits speaks to the advantage that we continue to have here in the United States. It’s this notion that if you get a good idea, and you organize some people to support you, and you learn from your mistakes, you can create something entirely new. You can become Bill Gates. You can become Bill Gates. Or, in some cases, you can electrify a village. You can save water in a desert. That’s the thing about the U.S. economy that continues to be unique. And it’s tied to capitalism and markets, but it’s also tied to a faith in science and reason and a mindset that says there’s always something new to discover, and we don’t know everything, and we’re going to try new things, and we’re pragmatic. And if we ever lose that, then we will have lost what has made us an incredible force for good in the world. If we sustain it, then we can maintain the kind of progress that has been made. I always tell interns and young people who I talk to that as tough as things seem right now, do not believe people when they tell you they wish they could go back to the good old days. Because the good old days aren’t—I’m now old enough where I remember some of those good old days. Does it annoy you, then, that the guy who wants to go back and is America’s most successful businessman, at least by his own reckoning, is Donald Trump? Well, I—there’s no successful businessman in America who actually thinks the most successful businessman in the country is Donald Trump. I know those guys, and so do you, and I guarantee you, that’s not their view. Tidskriftsomslag: Bloomberg Businessweek, 27 juni-3 july 2016. Politik: Inom säkerhetspolitiken är Clinton en hök! VAL 2016 | Clinton vill gärna lyfta fram sina erfarenheter som bl.a. utrikesminister i valrörelsen för att visa på skillnaden mellan henne och Donald Trump. Vad som är mindre känt är att hon ständig låg till höger om president Barack Obama i säkerhetspolitiska frågor när hon var hans Secretary of State. Även om hon har gått åt vänster i år för att inte tappa väljare till Bernie Sanders kommer hon sannolikt lita mer på USA:s militära makt som president än vad Obama gjort. Jack Sullivan, en av hennes kampanjrådgivare och tidigare medarbetare under hennes tid som utrikesminister, tror att hennes mer aggressiva framtoning i säkerhetspolitiska frågor ligger rätt i tiden. Enligt Sullivan går hennes strategi i valrörelsen ut på att visa för väljarna att hon har en klar och tydlig plan för att konfrontera terrorismen från islamisterna samtidigt som hon tänker utmåla Trump som en person utan några kvalifikationer överhuvudtaget när det gäller att hantera USA:s nationella säkerhet. Mark Landler kallar t.o.m. Clinton för hök när han skrev i The New York Times Magazine om Clintons instinkt på det utrikes- och säkerhetspolitiska området. Det är en bild som säkert kommer att överraska många av Clintons många beundrare runt om i världen, inte minst i Sverige. Jack Keane is one of the intellectual architects of the Iraq surge; he is also perhaps the greatest single influence on the way Hillary Clinton thinks about military issues. A bear of a man with a jowly, careworn face and Brylcreem-slicked hair, Keane exudes the supreme self-confidence you would expect of a retired four-star general. Though he is one of a parade of cable-TV generals, Keane is the resident hawk on Fox News, where he appears regularly to call for the United States to use greater military force in Iraq, Syria and Afghanistan. He doesn’t shrink from putting boots on the ground and has little use for civilian leaders, like Obama, who do. “I’m convinced this president, no matter what the circumstances, will never put any boots on the ground to do anything, even when it’s compelling,” Keane told me. Befriending Keane wasn’t just about cultivating a single adviser. It gave Clinton instant entree to his informal network of active-duty and retired generals. 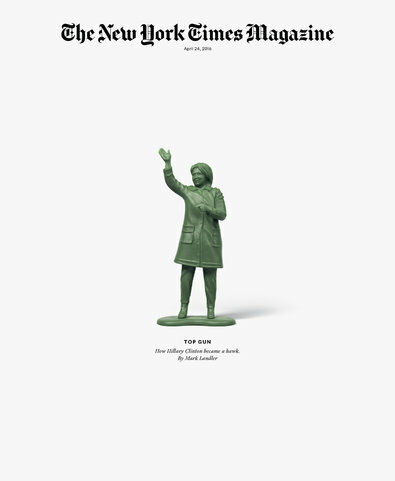 Tidskriftsomslag: The New York Times Magazine den 24 april 2016. Image: En presidents begränsade handlingsutrymme! EKONOMI | Hur stort inflytande har en amerikansk president på den ekonomiska utvecklingen i en modern ekonomi? Arbetslösheten i USA ligger på fem procent. Underskottet minskar och BNP ökar. Trots detta känner sig många amerikaner att utvecklingen går i fel riktning. Frågan är om president Barack Obama borde klarat av att kommunicera en mer positiv bild av vad som uppnåtts under hans tid i Vita huset – detta trots att hans politiska motståndare inte har vikt en tum i sin nattsvarta beskrivning av den ekonomiska utvecklingen. Andrew Ross Sorkin, finansiell kolumnist, skriver i The New York Times Magazine om det ekonomiska arv som Barack Obamas sannolikt lämnar efter sig. Often in our conversations, the president expressed a surprising degree of identification with America’s business leaders. 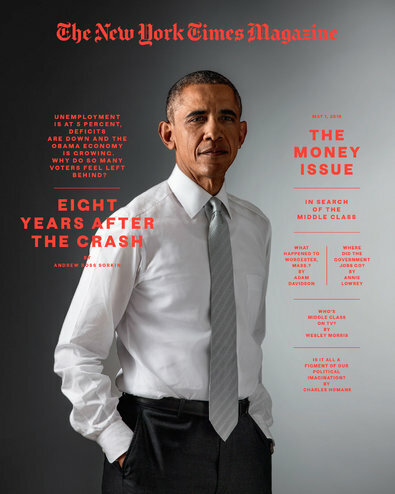 “If I hadn’t gone into politics and public service,” Obama told me, “the challenges of creating a business and growing a business and making it work would probably be the thing that was most interesting to me.” His showy embrace of capitalism was especially notable given his fractious relationship with Wall Street and the business community for much of his first term. When I asked him about these reactions, Obama laughed. The criticism he leveled at Wall Street “was extraordinarily mild,” he said, but “it hurt their feelings. I would have some of them say to me, ‘You know, my son came home and asked me, ‘Am I a fat cat?’ ” He laughed again. It has always been the case that voters credit or, more often, blame the president for the nation’s economic performance. But it is also the case that the president generally has considerably less sway to move the economy than even he might like to acknowledge. And as the economy continues to disperse, that sway may be diminishing further. A president has less power than ever, in either a hard- power (legal/regulatory) or soft-power (cultural) sense, over American chief executives, let alone over the chief executives of multinationals based in France or China or other places where many U.S. employers make their headquarters. Obama considered the problem from a political perspective. “In some ways,” he said, “engaging in those hard changes that we need to make to create a more nimble, dynamic economy doesn’t yield immediate benefits and can seem like a distraction or an effort to undermine a bygone era that doesn’t exist. And that then feeds, both on the left and the right, a temptation to say, ‘If we could just go back to an era in which our borders were closed,’ or ‘If we could just go back to a time when everybody had a defined-benefit plan,’ or ‘We could just go back to a time when there wasn’t any immigrant that was taking my job, things would be O.K.’ ” He didn’t mention Donald Trump or Bernie Sanders by name, but the implications were obvious. Tidskriftsomslag: The New York Times Magazine den 1 maj 2016. Politik: Barack Obamas utrikespolitiska doktrin! USA | Barack Obamas utrikespolitik har uppfattats av många som både motsägelsefull och otydlig. Någon röd tråd har varit svår att se. Jeffrey Goldberg, nationell korrespondent för The Atlantic, har träffat presidenten vid ett flertal sedan det första intervjutillfället 2006 när han träffade den dåvarande senatorn från Illinois. Under Goldbergs senaste möte med presidenten i Vita huset redogjorde Obama bl.a. för hur han ser på USA:s roll i världen och vilken utrikes- och säkerhetspolitisk skola han anser sig ligga närmast. Något förvånande är att Obama är en stor anhängare till den doktrin som i akademiska kretsar brukar kallas den realistiska skolan. Det är en inriktning som präglade president Richard Nixon och Henry Kissinger under deras tid i Vita huset. I Obamas fall lär det dock mest vara Brent Scowcroft, nationell säkerhetsrådgivare till president George H. W. Bush, som stått för inspirationen. 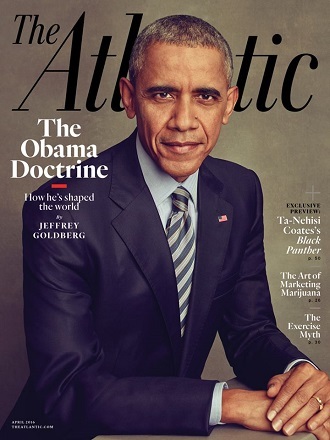 Tidskriftsomslag: The Atlantic, april 2016. PR: Humor och politisk kommunikation! POLITIK | Journalister och väljare gillar politiker som har humor. Frågan är bara om man vinner speciellt många väljare på det. En svensk politiker som lyckades leverera roligheter på löpande band var Kristdemokraternas Göran Hägglund. Men det hjälpte vare sig honom själv eller partiet när det väl var dags för val. Opinionssiffrorna och valresultaten imponerade aldrig under Hägglunds tid som partiledare. Emily Heil på engelska The Independent har skrivit en intressant artikel om hur Barack Obama använder humor för att få fram sitt politiska budskap för att kunna påverka allmänheten. Humor är vanligare i amerikansk politik än här. Och Obama verkar ha en genuin känsla för vad som går hem i stugorna. Och han levererar roligheterna utan att verka alltför krystad. For a long time, presidential humour was predictable as a knock-knock joke. Then along came President Obama, dropping the word “heezy,” mimicking viral memes, and quipping that he and Joe Biden are so close, they’d probably be denied service at an Indiana pizza joint. The president’s reputation as a funny guy is, of course, partly courtesy of the professionally crafted material he reads off the Teleprompters. It’s no secret: A team of speechwriters writes his correspondents’ dinner routines for him. But Obama has input in that process, said David Litt, a former White House speechwriter who’s now the head writer at the Washington office of comedy website Funny or Die. Obama has gotten plenty of unscripted laughs, too. During last year’s State of the Union address, Republicans cheered after he said he had no more elections to run. “I know, because I won both of them,” Obama zinged back. Those mic-dropping words didn’t appear in the advance copy of his remarks. But the laughs often aren’t for their own sake. Obama has used comedic venues to advance his agenda, particularly among young people who are more likely to share a viral video than watch one of his speeches. And the commander-in-chief’s style can fuel the criticisms that have long dogged him — that he is snooty and detached. Which, in Obama’s comedy world, is simply another opportunity to go meta. 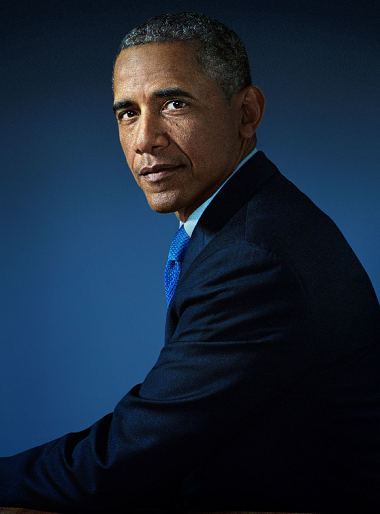 “Some people say I’m arrogant, aloof, condescending,” the president said at last year’s dinner.